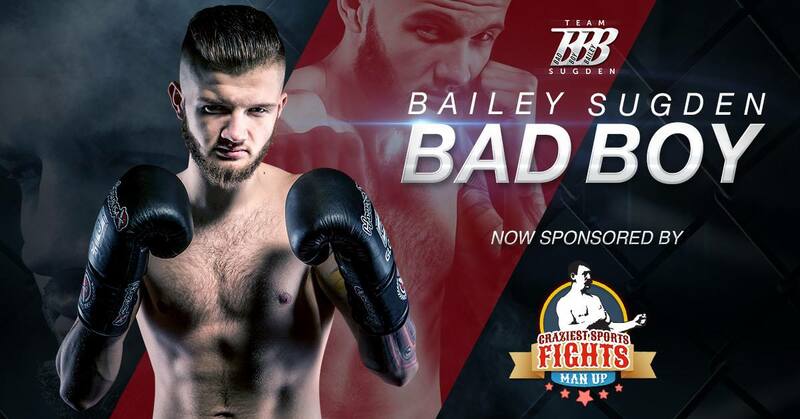 With just under two weeks to go till he steps back into the GLORY ring, Bailey ‘BadBoy’ Sugden is celebrating the news of a major new sponsorship deal that will send his profile skyrocketing on social media. A global news and entertainment publication for MMA, boxing and all types of contact sports, Craziest Sports Fights boasts a Facebook following of 2.7 million worldwide. Announcing the deal today, managing director Charles Walton said: “Bailey is without doubt one of the most exciting young prospects on the kickboxing stage today. He has already made his mark on GLORY and makes no secret of his determination to reach the top of the Featherweight division sooner rather than later. “We are delighted to lend our support by sponsoring this rising star and look forward to working closely with #BBB and his team at Suggy’s Gym as we share the news of his journey to the title through the Craziest Sports Fights website and Facebook page. Currently ranked number 10 on the world’s leading kickboxing promotion with two decisive victories under his belt since his GLORY debut in July 2017, the Nottinghamshire 20-year old will be looking to retain his unbeaten record when he takes on Zakaria ‘Double Z’ Zouggary on the card of the SuperFight Series of GLORY 52 Los Angeles on Saturday 31 March.